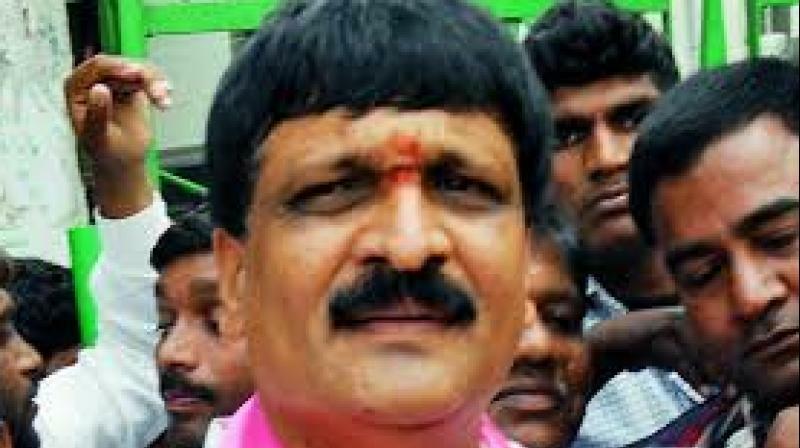 MLC Mynampally attacks ex-TRS worker, RTI activist Sai Prasad. Hyderabad: TRS city president and MLC Mynampally Hanumantha Rao and his men went wild at Petbasheerabad on Sunday night and assaulted a local politician at a wedding and an RTI activist at the police station. Following complaints from the victims, police booked two cases against the MLC and his aides. The incident began at KVR Garden function hall at night when Rao, who was not invited to the marriage, came to congratulate the bridegroom on the stage. The first victim, Dolly Ramesh, who was a former camp follower of Rao, was getting on to the stage when Rao and his men were coming down. “Rao got angry with Dolly Ramesh as he had left the TRS and joined the Congress a few months ago. Rao pushed Ramesh from the stage and started beating him up. Whoever tried to stop him was also beaten up,” said a witness and the second complainant P.M. Sai Prasad, who is an RTI activist. “Even the bridegroom’s father, Malla Reddy, who tried to stop the fighting, was also beaten up by the MLC,” said Prasad. After the fight, Dolly Ramesh approached the police, who then called Rao to the police station. When the police was talking to Rao and the complainant about the issue, the second assault took place. “As Dolly Ramesh is a friend of mine I went to the police station to help him. As soon as I entered the station Rao saw me and rushed towards me asking me to leave. He beat me up although five policemen were in the room. When cops took me out of the station and locked the gate to rescue me, Rao’s men jumped the gate and attacked me again,” said Prasad. Last year, in October first week, Alwal police had booked a case against Rao and his aides for beating up Prasad who had filed a PIL and an RTI petition against Rao and his wife for allegedly grabbing a public park. Rao had allegedly been threatening to kill the RTI activist if he did not withdraw the PIL. The case is still being investigated by Alwal police. Police said that they had launched an investigation. “We have booked a case against Rao under IPC Section 149 (unlawful assembly), 323 (inflicting injuries), and 506 (criminal intimidation),” said inspector D.V. Ranga Reddy of Petbasheerabad police. Despite attempting to reach him several times on the phone Rao was not available for comment on this issue.